Sharing the Joy at Christmas! It’s what we all try to do, right? Whether it’s with family, with friends, or brightening the day of a stranger – as they say, ’tis the season! Today I hope you’ll join our Paper Craft Crew Sketch Challenge PCC270 – and share some joy! I decided to combine parts from a few of different bundles to create my card. What’s a holiday without a little shine and sparkle?! I added both, with the foil sheets and glimmer paper. I followed the sketch pretty closely this time; it was so interesting! First create a card base with Pacific Point cardstock, then layer a panel of Silver Foil Sheet on top, with Dimensionals. Next, add a panel of Pacific Point cardstock. Now you want to get your die cutting done. Use the Seasonal Layers Thinlits with the Big Shot, and die cut 1 each of the 3 sizes of snowflakes from Silver Glimmer Paper. Keep a few of the small circles that you punch out of the largest snowflake. Next, use the Eastern Medallions Thinlits to die cut the 4 pointed shape from Silver Foil Sheet scraps. Create your sentiment banner from a 3/4″ x 4″ long piece of Vellum cardstock. Cut another banner the same size from the Silver Glimmer Paper. Stamp the sentiment from the Ready for Christmas stamp set in Versamark ink. 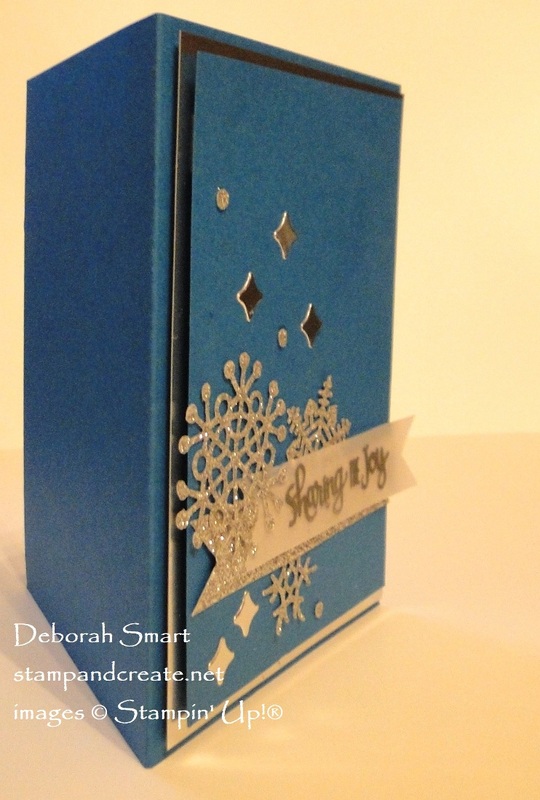 Cover the stamping with Silver Embossing Powder, and set with the Heat Tool. Use your Paper Snips to cut banner tails on both ends of each banner. First, attach the vellum banner to the glimmer banner with Mini Glue Dots. DEMO TIP: To hide the dots, place them strategically behind the stamped letters. Offset the banners so that the sentiment is slightly above and to the right of the glimmer banner. Next, attach the banners to the card front with Stampin’ Dimensionals. 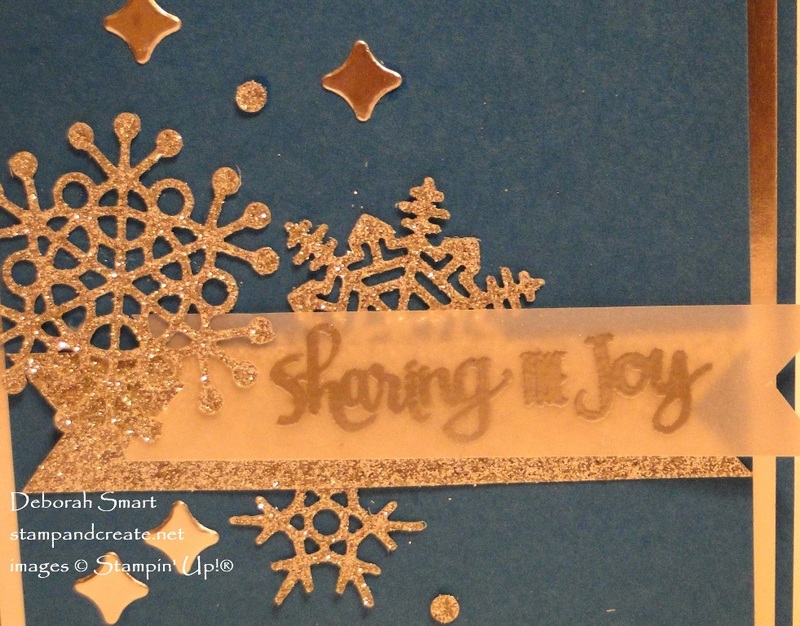 To attach the glimmer snowflakes, use the Multipurpose Liquid Glue sparingly on the back of the snowflakes. Once they are attached, you can now attach the 4 pointed silver foil stars, and the few small glimmer circles that you saved from the large snowflake. By using liquid glue to attach the snowflakes, the ‘bulk’ is kept to a minimum. That way, you could mail this card without extra postage! If you haven’t already, please be sure to check out the fabulous cards created by the rest of the Design Team. Click over to the Paper Craft Crew challenge page; you can also get the link there. Once you’ve created your card, link up, and who knows – you may be our next Top Pick! 🙂 I’m looking forward to seeing what you create. Simply click on the product images below, or click on my signature to go directly to my online store. You can order any time day or night; it’s open 24/7. I do appreciate it! What a beautiful card, Deborah. It looks so rich. Lovely! Beautiful card, Deborah! I love the shimmer and sparkle! !